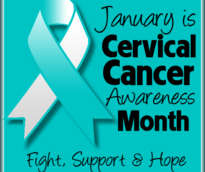 January is Cervical Health Awareness Month! The Gwinnett, Newton, and Rockdale County Health Departments encourage every woman to make a New Year’s resolution to talk with their healthcare provider about cervical health! Nearly 12,000 women in the United States are diagnosed with cervical cancer each year, and of those, about one-third will die as a result of the cancer. But the disease is highly preventable and treatable with improved vaccinations and screenings! The American Social Health Association (ASHA) and the National Cervical Cancer Coalition have named January Cervical Health Awareness Month to encourage women in the United States to receive the human papillomavirus (HPV) vaccine if they are eligible and get the appropriate age-based Pap and HPV tests. We offer both the vaccine and the women’s health screenings at all of our clinic locations, just visit www.gnrhealth.com/locations to find the one closest to you! Contributed by Women’s Health staff member, Capri Martinez.